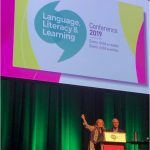 Kathy Rastle was another keynote speaker at last week’s great Language, Literacy and Learning conference whose topic is directly relevant to this blog. You might remember her as a co-author of last year’s influential paper about Ending the Reading Wars, and of this related article (both highly recommended reading). Hers was the final keynote of the conference, but I met her on the first day. Being a dairy farmer’s daughter who went to Warrnambool High School, I’m still always a little amazed when people with titles like Professor and Head of the Department of Psychology at Royal Holloway, University of London say “hi, I’m Kathy”, and are utterly smiley, nice, and not the least bit pretentious. 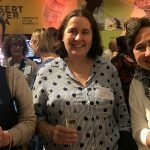 Here Kathy is (on the right) with the also-legendary and lovely Lyn Stone (on the left) and Sarah Awesome (AKA Asome) of Bentleigh West PS, (check out their NAPLAN Year 3 spelling gain here!) at the conference Sundowner drinks. However, in the interests of showing proper, gender-neutral academic respect I’ll use her surname from now on. This entry was posted in curricula, research, reviews, teaching strategies, theory and tagged beginning reading, effective reading teaching, evidence-based reading teaching, helping children learn to read, how children learn to read, learning to read, novice readers, reading acquisition, teaching children to read, teaching reading on April 11, 2019 by alison. I’ve just been to a fantastic conference in Perth, organised by the Dyslexia SPELD Foundation of WA. I missed the first one in 2017 because of a diary facepalm, and have been kicking myself and looking forward to this conference ever since. I took my laptop, imagining I’d find time each evening to write a riveting blog post about the day’s new learning. 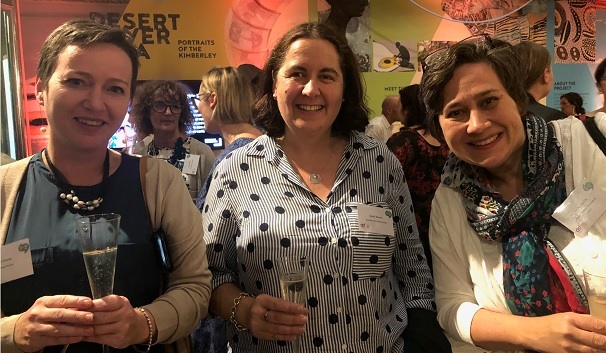 Instead I kept going out for drinks with colleagues, sorry not sorry, but a room full of like-minded colleagues is an irresistible thing of beauty and a joy forever. Then I was going to write a blog post on the plane, but found myself chatting to the nice and distractingly handsome young bloke sitting next to me, sorry not sorry again. Since then I’ve realised that any blog post that did justice to the whole conference would need to be about a kilometre long. So I’ve decided to just write a few posts about the best bits. French cognitive neuropsychologist Professor Stanislas Dehaene gave the opening keynote address of the conference. He firstly told us we should forget everything we’ve heard about the differences between the left and right brain. Young children’s brains are astonishingly flexible and able to reorganise. There are twice as many synapses in a child aged one or two as in an adult. Synapses come and go all the time. A child whose entire left hemisphere was surgically removed in infancy was still able to learn language and literacy more or less along the usual lines. When we learn to read, we establish a new visual interface into the language system. It develops in an area of the brain otherwise used to recognise faces and objects, but the cells (called voxels) in it are weakly specialised. When you teach children to read, you specialise voxels for words. In the process of learning to read, the task of recognising faces and objects is partially displaced to the right hemisphere. The lack of this displacement is therefore also a marker of dyslexia. This makes room for the creation of the Visual Word Form Area (VWFA), and the development of a whole new circuit for processing language visually. Learning to read increases the physical connections (myelination) between vision and language in the brain. The VWFA develops in the same area in the brain, regardless of which language you speak. Learning music or maths also reorganises your brain. Competition for neurons means that learning music shifts your VWFA slightly. Brain scans of mathematics professors looking at numbers and formulas appear different from scans of the brains of humanities professors on equal salaries looking at the same numbers and formulas. The process of learning to read then changes the spoken language system. The brain area that children typically re-purpose for reading has already been specialised for recognising faces and objects by the non-literate adult brain. This makes it much harder to learn to read as an adult. We see this in the slow progress of most adult learners. It’s a bit too late for their brains to re-specialise. It’s also harder to relearn reading if this skill is lost. A colleague of Dehaene’s had a small, specific stroke to the reading area of the brain and lost the ability to read. He was eventually able to relearn in a painstaking, letter-by-letter way, but not able to read fluently. While neuroplasticity declines gradually over time, puberty is an important moment for the loss of brain plasticity. France has a national phonics check to make sure children can read 50 simple words by the end of grade 1. This is not controversial. To study brain area activation in children in Dehaene’s lab, they ask children to pretend to be astronauts going on an adventure in a rocket, and this helps them find going into a scanner to have their brains scanned fun, not scary. Learning to read is at first very effortful. In their first year of learning to read, children’s brains light up a lot on scans during reading. In the second year, skills are more automatised so there is lower activation. Our brains have a mirror invariance system that allows us to recognise objects as the same, even though they look different from different angles. We have to override this system when we learn to read, so we can perceive letters like p, q, b and d as different. This is difficult and takes time, which is why children often reverse letters. Learning the different gestures involved in writing each letter allows us to surmount this problem. Children need strong oral language in order to learn to read, including strong phonology (speech sounds) and a strong lexicon (vocabulary). When they start school, teaching needs to focus first on phoneme-grapheme (sound-spelling) mappings, as this is the main route into reading. These must be explicitly taught, as the concepts involved are very abstract. Children must relate the space of the written word to the time of the spoken word. At first, graphemes must be consciously processed in a series/one by one. As the learner’s skills and experience grow, the letters of a word start to be unconsciously processed in parallel/all at the same time. This frees up the learner’s attentional resources to focus on the meaning of what is being read. Dehaene says, “Reading is never global or whole word, especially not in children”. Beginning readers engage in slow, serial decomposition of words, and skilled readers engage in fast, parallel decomposition of words. This means it’s time to stop asking children to memorise lists of high-frequency words. Research has shown that whole word memorisation doesn’t help to create the brain’s reading circuit. A group of researchers (Yoncheva et al) taught two groups of adults to read an artificial script. One group was taught to pay attention to the words as wholes (taught in a Whole Word way). The other group was taught to pay attention to the graphemes and phonemes (sounds and letters) in the words (taught in a phonics way). Only the group taught using the phonics approach were then found to have left brain activation when reading the script. The whole word group had right brain activation. The group taught using a phonics approach were able to generalise what they had learnt to allow them to read new words written in the same script. The group taught to pay attention to whole words couldn’t do this. Think about this. Intelligent adults did not deduce the alphabet from words, yet that’s what young children are often expected to do. Directing attention correctly sends information to the correct brain circuits. 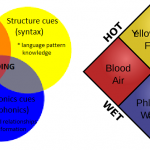 Whenever you train phonics you improve comprehension, because reading is a cipher. 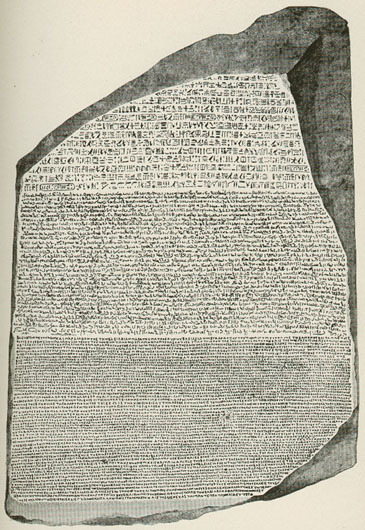 Think of the Rosetta Stone. If you can’t decode it, you can’t understand it. Developing adult-level language comprehension is a long-term process, involving vocabulary enrichment, understanding of complex referents and so on. Once you can read, this changes your spoken language system. It gives you access to more and different language. Our brains have a circuit which specialises for recognising writing gestures. There is a lot of evidence that reading improves when learning to write. The research is very clear that reading and writing should be taught together. You can learn to type later on. Daily practice and sleep are also very important for learning. Reading in the Brain by Stanislas Dehaene is published by Penguin Random House. Highly recommended. I have a dog-eared copy, but in a weird, groupie way bought an extra copy I will probably never read for him to sign at the conference. 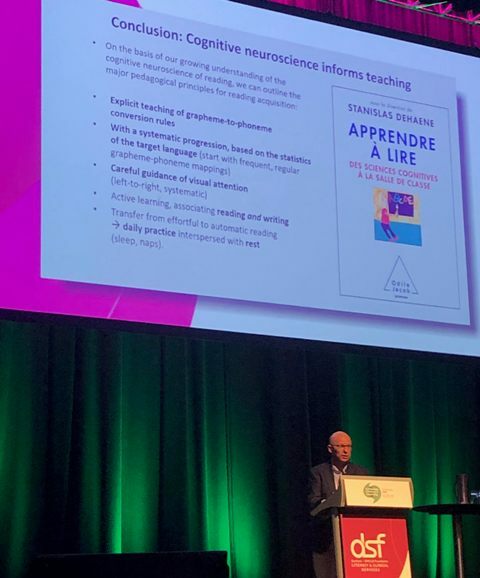 He also wrote a book called “Apprendre à lire: Des sciences cognitives à la salle de classe“, which my rusty high school French translates as “Learning to read: from cognitive science to the classroom”. I’m looking forward to the (apparently imminent) English translation. In 2015 I wrote a couple of blog posts about Prof Dehaene’s work, one of which includes a link to a video of him giving a talk. They are here and here. This entry was posted in research, reviews, teaching strategies and tagged cognitive science and reading, creating the reading brain, helping children learn to read, helping children to sound out words, how children learn to read, Language literacy and learning conference 2019, learning to read, learning to read changes the brain, reading in the brain, why phonics works on April 10, 2019 by alison. Early years teachers around Australia are this week starting to set up their classrooms for the new school year. Many are about to set up alphabet friezes and word walls. I’m hoping that my new, cheap-and-cheerful embedded picture mnemonics ($10 plus GST) will encourage and help them to instead set up sound friezes or sound walls. 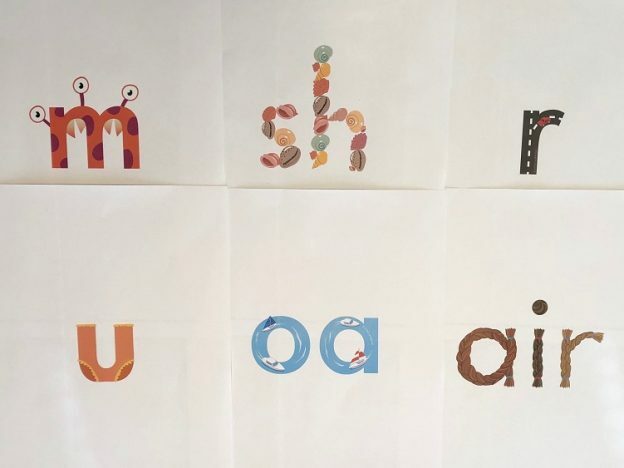 Early last year I commissioned talented, tolerant, patient Melbourne illustrator Cat MacInnes to turn my vague ideas into 46 cute, colour pictures you can print to help kids learn sound-letter relationships. They’re her copyright, so I have a limited number available (get in quick!). 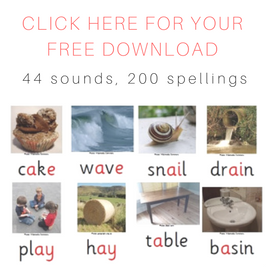 This entry was posted in phonics activities, sound-letter links, sounds, spellings, teaching strategies, Uncategorized and tagged letter-sound links, sound walls, sound-letter links, teaching letter-sound relationships, teaching phoneme-grapheme correspondences, teaching sound-letter relationships on January 23, 2019 by alison. Last week, I read my state education department’s booklet advising parents on how to help children with literacy and numeracy. I understand it will be in the Prep bags given to all Victorian children starting school in 2019. I was, frankly, appalled. The booklet mentions phonics only once, saying onscreen phonics games improve reading and “letter sound awareness”, whatever that is. It doesn’t mention phonemic awareness or handwriting at all. 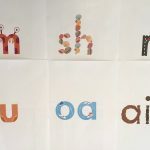 This entry was posted in blending and segmenting, consonants, phonics activities, sound-letter links, sounds, spellings, teaching strategies, vowels, word attack on January 1, 2019 by alison. 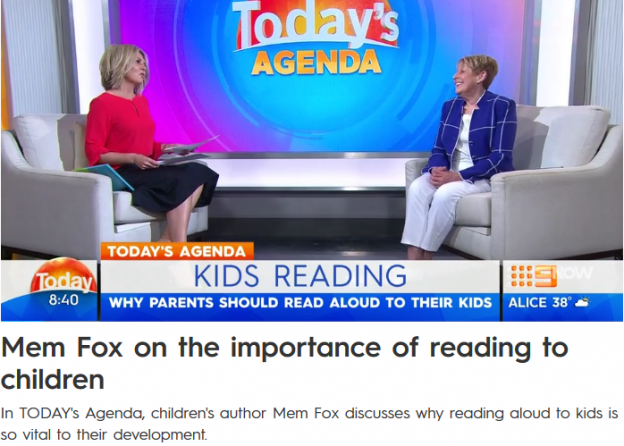 On telly’s Today show last week, celebrated children’s fiction author Mem Fox talked about the importance of reading to children, something with which absolutely everyone agrees. Mem Fox’s missionary parents took her to Southern Rhodesia as an infant. 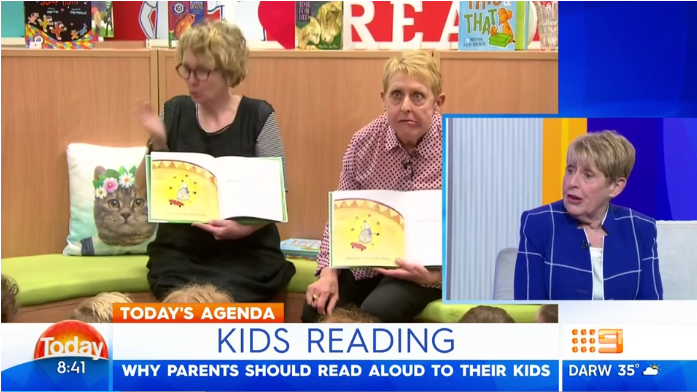 They were, she explains, “very keen on Australian books being read to us, and our reading Australian books”. TV hadn’t been invented, so she developed a love of reading. She thanks three years at drama school in London for her understanding of language and thus ability to write books. I suspect this training may also have contributed to her storytime drama skills. All good. 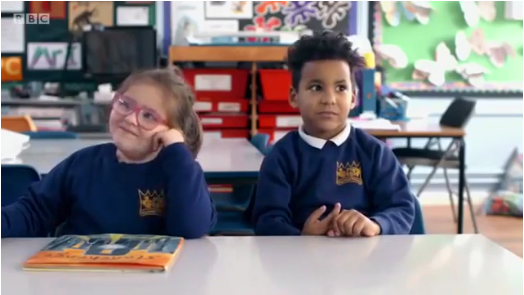 Then, about three minutes into the interview, I thought I heard Ms Fox say that young children are increasingly unable to communicate effectively using spoken language. I did a double-take. I’m a paediatric speech pathologist. You’d think I’d know about this, if it were true. 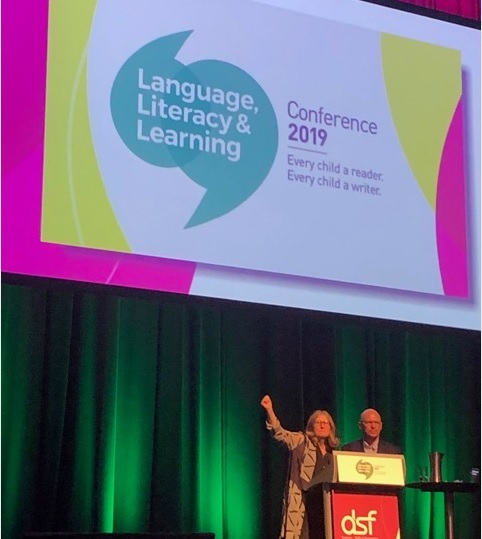 I don’t recall any mention of a general decline in young children’s ability to communicate at this year’s Speech Pathology Australia conference, or in any of the journals I’ve read lately. This entry was posted in books, Fun, phonics activities, research, teaching strategies, whole language on November 6, 2018 by alison. THIS is a BORING book! I’ve just watched a great 2016 BBC4 documentary called “B is for book”. It follows a group of London children from their first day at school for a year, and explores how they learn to read. The kids live on a public housing estate in Hackney, and most speak languages other than English at home. The film is not currently on the BBC website, but a few people have put it on YouTube. The version I watched is here, and you might like to keep it open in a new tab while you read, so you can quickly find and watch the interesting bits I describe below. 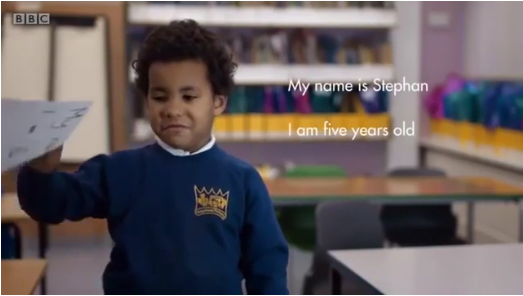 You’ll love all the children, but I was most entranced by a little boy called Stephan. An honest child with a low tolerance for Educrap, he looks and behaves a lot like a little boy I worked with last year, also a twin from public housing inclined to slide under the table. This entry was posted in books, curricula, literacy problems, new words, phonics activities, sound-letter links, teaching strategies and tagged books for young children, predictable books, predictable texts, repetitive books, repetitive texts, teaching children to read, teaching children to sound out words, teaching reading on October 21, 2018 by alison. 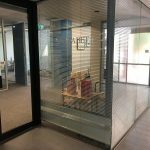 A state election looms here in Victoria, and parent-run group Dyslexia Victoria Support (DVS) is petitioning politicians to provide decodable books to all kids starting school in 2019. 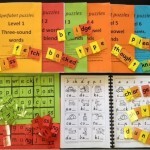 Decodable books provide the reading practice for phonics lessons. 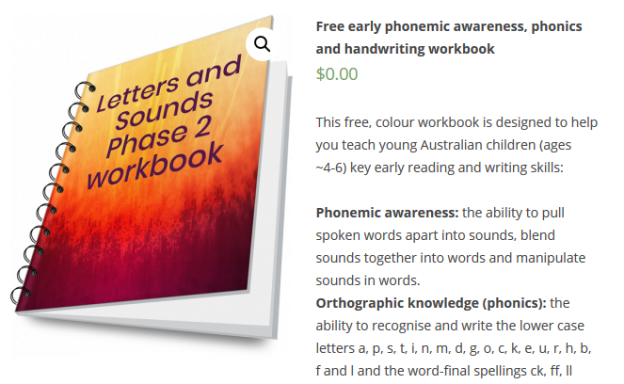 They include sound-letter relationships and word types learners have been taught, plus usually a few high-frequency words with harder spellings needed to make the book make sense, which are also pre-taught. Decodable books would replace the widely-used predictable/repetitive texts, which encourage children to guess and memorise words, not sound them out. At the moment, children might be learning about “i” as in “sit” in phonics lessons, but take home a predictable text that might contain words like “find”, “ski”, “shield”, “bird”, “friend” or “view”. Instead of helping kids practise the sound-letter relationships they’ve been taught, their home readers can undermine this teaching. 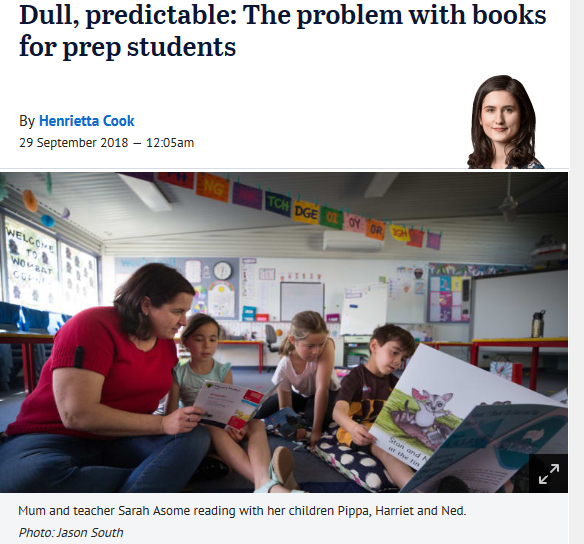 DVS’s campaign hit the statewide media this weekend, yay, with an article called “Dull, predictable: the problem with books for prep students” in Fairfax newspapers. This entry was posted in books, curricula, literacy problems, phonics activities, research, sound-letter links, teaching strategies, theory and tagged decodable books, helping kids sound out words, learning to read, sounding out words, teaching children to read, teaching reading on October 1, 2018 by alison.